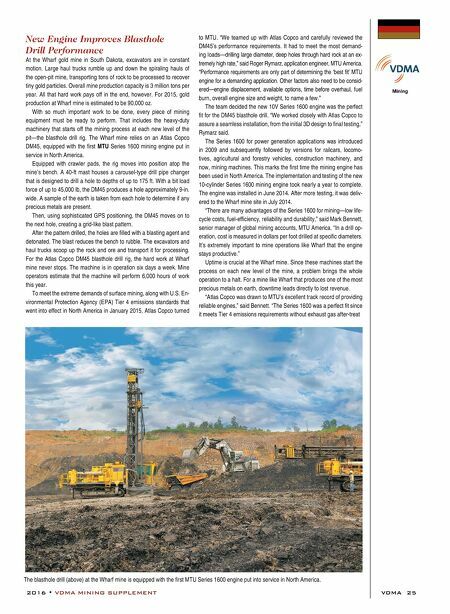 2016 • VDMA MINING SUPPLEMENT VDMA 25 New Engine Improves Blasthole Drill Performance At the Wharf gold mine in South Dakota, excavators are in constant motion. Large haul trucks rumble up and down the spiraling hauls of the open-pit mine, transporting tons of rock to be processed to recover tiny gold particles. Overall mine production capacity is 3 million tons per year. All that hard work pays off in the end, however. For 2015, gold production at Wharf mine is estimated to be 90,000 oz. With so much important work to be done, every piece of mining equipment must be ready to perform. That includes the heavy-duty machinery that starts off the mining process at each new level of the pit—the blasthole drill rig. The Wharf mine relies on an Atlas Copco DM45, equipped with the first MTU Series 1600 mining engine put in service in North America. Equipped with crawler pads, the rig moves into position atop the mine's bench. A 40-ft mast houses a carousel-type drill pipe changer that is designed to drill a hole to depths of up to 175 ft. With a bit load force of up to 45,000 lb, the DM45 produces a hole approximately 9-in. wide. A sample of the earth is taken from each hole to determine if any precious metals are present. Then, using sophisticated GPS positioning, the DM45 moves on to the next hole, creating a grid-like blast pattern. After the pattern drilled, the holes are filled with a blasting agent and detonated. The blast reduces the bench to rubble. The excavators and haul trucks scoop up the rock and ore and transport it for processing. For the Atlas Copco DM45 blasthole drill rig, the hard work at Wharf mine never stops. The machine is in operation six days a week. Mine operators estimate that the machine will perform 6,000 hours of work this year. To meet the extreme demands of surface mining, along with U.S. En- vironmental Protection Agency (EPA) Tier 4 emissions standards that went into effect in North America in January 2015, Atlas Copco turned to MTU. 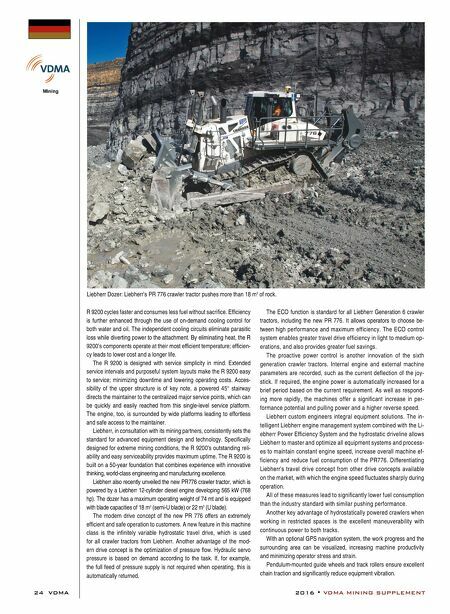 "We teamed up with Atlas Copco and carefully reviewed the DM45's performance requirements. It had to meet the most demand- ing loads—drilling large diameter, deep holes through hard rock at an ex- tremely high rate," said Roger Rymarz, application engineer, MTU America. "Performance requirements are only part of determining the 'best fit' MTU engine for a demanding application. Other factors also need to be consid- ered—engine displacement, available options, time before overhaul, fuel burn, overall engine size and weight, to name a few." The team decided the new 10V Series 1600 engine was the perfect fit for the DM45 blasthole drill. "We worked closely with Atlas Copco to assure a seamless installation, from the initial 3D design to final testing," Rymarz said. The Series 1600 for power generation applications was introduced in 2009 and subsequently followed by versions for railcars, locomo- tives, agricultural and forestry vehicles, construction machinery, and now, mining machines. This marks the first time the mining engine has been used in North America. The implementation and testing of the new 10-cylinder Series 1600 mining engine took nearly a year to complete. The engine was installed in June 2014. After more testing, it was deliv- ered to the Wharf mine site in July 2014. "There are many advantages of the Series 1600 for mining—low life- cycle costs, fuel-efficiency, reliability and durability," said Mark Bennett, senior manager of global mining accounts, MTU America. "In a drill op- eration, cost is measured in dollars per foot drilled at specific diameters. It's extremely important to mine operations like Wharf that the engine stays productive." Uptime is crucial at the Wharf mine. Since these machines start the process on each new level of the mine, a problem brings the whole operation to a halt. For a mine like Wharf that produces one of the most precious metals on earth, downtime leads directly to lost revenue. "Atlas Copco was drawn to MTU's excellent track record of providing reliable engines," said Bennett. "The Series 1600 was a perfect fit since it meets Tier 4 emissions requirements without exhaust gas after-treat The blasthole drill (above) at the Wharf mine is equipped with the first MTU Series 1600 engine put into service in North America.